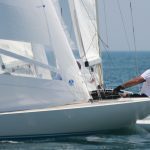 The first three days of racing produced a tantalisingly close leader board in the 70th edition of this iconic regatta, which forms the Dragon class’s open British Championship. 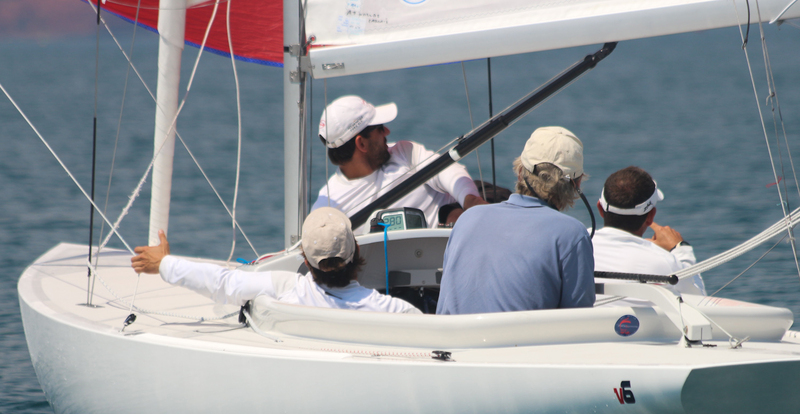 With only one point separating the top three boats, there was enormous pressure on the leaders in the final race. 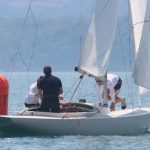 The event, run by the Royal Torbay Yacht Club, saw a wide mix of conditions, including big onshore seas and winds over 20 knots, while other races were sailed in fluky light airs in which the breeze frequently dropped below five knots. Laurie Smith’s Alfie delivered an impressive master class in consistency, counting a second place, three thirds and a fourth, while discarding a fourth. It was the kind of performance that would easily win most regattas. By contrast, Graham and Julia Bailey’s Aimee had a wobble on Day 2 that saw them finish 12th in the first race of the day and a sixth they had to count in the second. However, in every other race they dominated the front of the fleet, scoring three wins and a second place. Aimee and Grant Gordon’s Louise Racing went into the final race tied on 10 points, with Smith third overall on 11 points. After one general recall the fleet got away cleanly under a black flag. 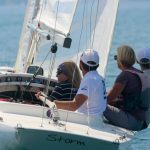 Aimee’s strategy was clear at the outset – they hung back at the committee boat end in a conservative start and tacked immediately to the favoured right-hand side of the course. The fleet split exactly 50/50 up each side of the first 1.0 mile long beat, until Laurie Smith was one of the earlier boats of the left hand group to tack onto port. However, Gordon held out on the left for longer. For a while it looked as though a growing number of boats in the middle were in better breeze, yet Aimee continued on port tack until 10 lengths off the layline. How did it feel to be hard out on the right hand side of the fleet on the first beat when the championship was at stake? “We were pretty confident,” says Graham Bailey. 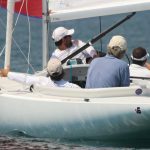 “There’s something going on with the current here – we were taking cross bearings on the fleet and could see quite early on that we were going the right way – we just wound round them all. 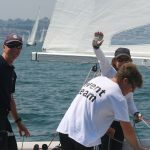 By the first windward mark she had drawn out a commanding lead of more than a minute and a half on Eric Williams’ Ecstatic. Andrew Millband’s Supremacy was next round, followed by Ron James’ Fei-Lin’s Flirtation and Peter Cunningham’s Power Play in fifth. However, Alfie was buried in 10th place, with Louise Racing a couple of lengths further behind. On the first run Aimee continued right to the layline before gybing, building her lead on Ecstatic even further at the bottom mark. This pair was not challenged again for the rest of the race. Peter Cunningham’s Power Play had another good race, finishing third, while Smith worked his way up to fourth place. Fei-Lin’s Flirtation also had a good day, finishing fifth. By contrast, Louise Racing never recovered and finished 12th, a result they discarded. Aimee took overall victory with 11 points, with Alfie second on 15 points, and Louise Racing third on 16. Aimee also won the Corinthian Division, ahead of Jono Brown’s Storm, Simon Barter’s Bertie and Mark and Amanda Wade’s Avalanche. Huge thanks go to the Royal Torbay Yacht Club, vice commodore Phil Rumbelow, and race officers Bill Butcher and Gill Smith for organising an excellent series of racing and equally impressive après sailing events. Thank you to Upham Brewery for providing some fantastic after-racing beers on the first night. A big thank you to the Abersoch, Solent and Irish Dragons fleets who hosted some fantastic evening events for all Dragon sailors and to Peter Cunningham who very kindly bought all of the wine for our final prize giving dinner. It has been a fantastic event full of great racing, great weather and even better socials. We hope to see you all again next year in Abersoch!